A delegation of social justice leaders hand delivered a letter this week to the Sanderson Farms poultry plant in Bryan, Texas. While they did so, protesters outside the plant held aloft signs about working conditions inside the plant. 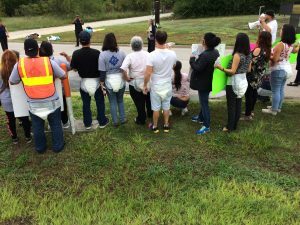 Many of the protesters donned diapers to bring attention to workers being denied access to the bathroom. The plant manager, Jeff Black, accepted the delegation’s letter. It was addressed to Joe F. Sanderson, Jr., the Chief Executive Officer of Sanderson Farms and asks the firm to address chemicals hazards, lines speeds, sexual harassment, and restrictions on workers’ use of the bathroom. More than 1,200 employees work at the plant in Bryan, TX. Videla was part of the delegation that delivered the letter. She was joined by Nora Morales, also of CDL, Rev. Trent Williams with the United Church of Christ, Martha Ojeda of Interfaith Worker Justice, and Alex Galimberti of Oxfam America. Poultry workers being denied access to the bathroom is a public health problem that is familiar to readers of The Pump Handle. We’ve written about it (here, here) and have included testimonials from workers about restrictive bathroom policies at least five different poultry companies. Sanderson Farms’ Chief Financial Officer Mike Cockrell told KBTX said that the allegations about bathroom breaks are inaccurate. But frankly, I’m skeptical of Sanderson’s denial. I’m skeptical because of the disconnect between what I’ve heard from Sanderson Farms’ workers and what I read in the company’s official publications. The two don’t match up. At its Bryan, TX poultry plant, for example, the company does not provide paid sick leave. Forcing workers to chose between going to work sick or not getting paid shows little concern for employee welfare. The Sanderson Farms plant in Bryan, TX also does not carry workers’ compensation insurance. (The State of Texas allows employers to “opt-out” of the workers’ compensation (WC), but only 22 percent of employers do so. Generally, it is the small employers who opt-out.) I suspect the company also doesn’t carry WC insurance for employees at its facilities in Palestine, TX and Waco, TX. “In fiscal year 2017, Sanderson Farms received only two OSHA citations out of more than 15,000 employees and only one citations was considered ‘serious'”. That’s not what I find looking at the OSHA data. For the period November 1, 2016 through October 31, 2017 (Sanderson Farms’ fiscal year 2017), I see an inspection that commenced in January 2017. OSHA launched the inspection at Sanderson Farm’s poultry plant in Waco, Texas following a release of anhydrous ammonia. The company received citations for six serious violations and OSHA proposed penalty of $70,000. I attended the demonstration this week outside the Sanderson Farms plant in Bryan, Texas. I heard poultry workers from Texas, North Carolina, and Arkansas describe hazards that cause injuries and illnesses. I heard Rev. Trent Williams call on all companies to treat their employees with dignity and respect. I heard vehicle drivers give friendly honks of their horns to show support. What I want to hear next (and soon) is that workers at Sanderson Farms are given unrestricted access to the bathroom when their bladders and bowels demand it. 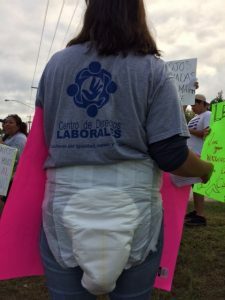 Member of Centro de Derechos Laborales protesting in Bryan, Texas at Sanderson Farms poultry plant.